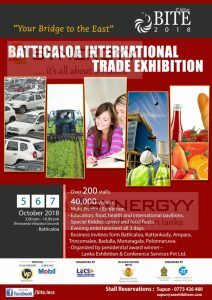 Lanka Exhibition and Conference Service organise a Batticaloa International Trade Exhibition 2018 with over 200 Stalls on 5th to 7th October 2018. 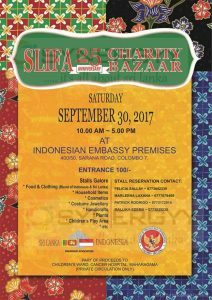 Venue: Shivananda Vidyalaya Grounds, Batticaloa. The Exhibitor expected to attracts 40,000 Visitors from the eastern province and island wide. Education, food, health and international pavilions. Special Kiddies corner and food fiesta. Evening entertainment all 3 days. Business invitees form Batticaloa, Kattankudy, Ampara, Trincomalee, Badulla, Monaragala, Polonnaruwa. Gampola Zahira Anniversary Walk 2018 – 20th January 2018. Gampola Zahira imitates all Gampola Zahirians to join on Gampola Zahira Anniversary walk with the theame of “for change” on 20th January 2018. 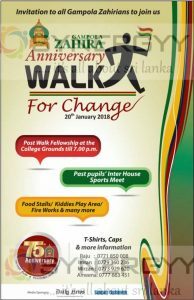 Post Walk Fellowship at the College Grounds till 7.00 p.m.
Posted on January 15, 2018 January 15, 2018 Categories Education, NEWS, Srilanka School Education Events and NewsTags 2014 concerts, art exhibition, art exhibitions, buy concert tickets, community events, concert, concert online, concert ticket websites, concert tickets, concert tickets online, concerts in, concerts near me, event, event calendar, event management, event planner, event planning, event production, events today, exhibition, exhibition ideas, exhibitions, Horse Racing, Horse Racing in Sri Lanka, jazz concert, live concert, live nation, local concerts, local events, local events today, manager, museum exhibits, music, music concert tickets, music concerts, musical tickets, new exhibitions, Nuwara elia Horse Racing, rock concerts, special events, summer concerts, tickets concert, tickets for concerts, upcoming concerts, upcoming events, weekend events, where to buy concert ticketsLeave a comment on Gampola Zahira Anniversary Walk 2018 – 20th January 2018. 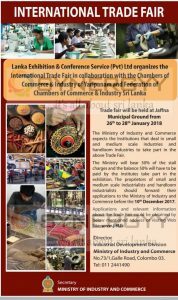 Trade fair will be held at Jaffna Municipal Ground from 26th to 28th January 2018, The Ministry of Industry and Commerce expects the Institutions that deal in small and medium scale industries and handloom industries to take part in the above Trade Fair. 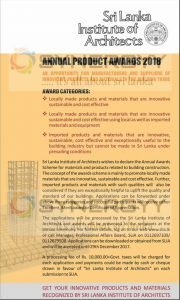 Sri Lanka Institute of Architects wish to declare the annual aware scheme for materials and products related to building construction. The concept of the aware scheme is mainly to promote locally made materials that are innovative, sustainable and cost effective. Further imported products and materials with such qualities will also be considered if they are exceptionally helpful to uplift the quality and standard of our buildings. Applications can be forwarded under below 3 categories and successful participants will receive either excellent, merit aware or certificate of appreciation. 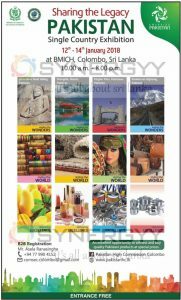 Locally made products and materials that are innovative sustainable and cost effective using local as well as imported materials and equipment. applications will be accepted until 29th December 2017, a processing fee of Rs. 10,000/- + Government Taxes will be charged for each applications. Applications will be processed by the Sri Lanka Institute of Architects and awards will be presented to the recipients at the annual ceremony. 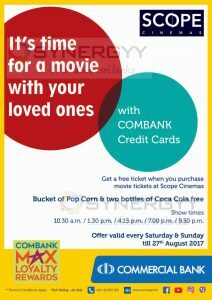 For further details log into www.slia.lk or call 0112 697109 / 0112 679508. China Council for a promotion of international trade guangdong committee organised 3rd China Product Exhibition in Colombo, Sri Lanka from 22nd to 24th November 2017 at Sri lanka Exhibition & Convention Centre (SLECC) from 10.00 Am to 6.00 Pm. Interactive seminars on doing business with china for a details visit www.chinasrilankaexpo.com for free seats. 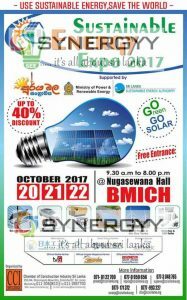 Chamber of Construction Industry Sri Lanka organised a Sustainable Energy Expo 2017 on 20th to 22nd October 2017 at Nugasewana Hall at BMICH, the event is supported by Ministry of Power & Renewable Energy and Sri Lanka Sustainable Energy Authority. This exhibition is good place to obtain all Solar Power energy systems and alternative sustainable energy products for your day today life such as Solar Street Light, Electric Scooter, Generators, Solar Systems, Wind Power & Bio Gas Tanks and Switches & LED Bulbs for reduce your energy consumption and easy to your pocket. 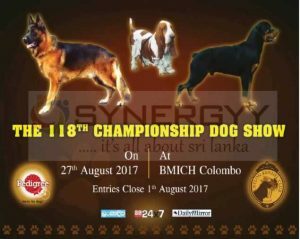 Ceylon Kennel Club organised 118th Championship dog shows on 27th August 2017 at BMICH Colombo. Entries Close on 1st August 2017. 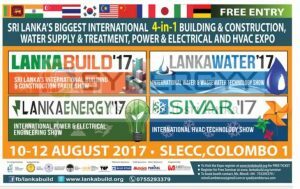 AMBTarsus Event Group organise four in one exhibition of Building Construction, Water Supply & Treatment, Power & Electrical and Hvac Exhibition on SLECC from 10th to 12th August 2017. If you are into business of Building Construction, Water Supply & Treatment, Power & Electrical and Hvac its a good opportunity for you to build network with new parties who are into the same business. 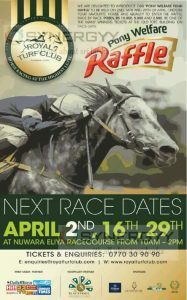 Races starting from 10 Am to 2 Pm at Nuwara Eliya Racecourse. Cinnamon Sri Lanka Photo Contest is an initiative by Cinnamon Hotels & Resorts to celebrate the best photography and videography captured in Sri Lanka. Our island invokes a million spectacular visuals from vibrant landscapes to ancient architecture and beyond. We want to celebrate these many visuals as Sri Lanka poises itself to become the world’s favourite holiday destination. Register now and apply in a series of categories for a chance to win a 3-week all-expenses paid holiday in Sri Lanka. You could be a world class photographer or a traveller with a camera – we want to see Sri Lanka through your eyes. Join us as we celebrate the magic of Sri Lanka. The image will be award with USD 5000 and a 21-day curated tour of Sri Lanka! 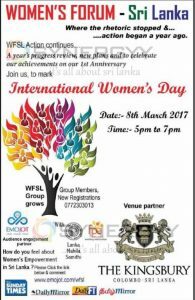 A first year anniversary and women’s forum is schedule to be conduct at Kingsbury on 8th March 2017 on international women’s day from 5.00Pm to 7.00Pm. The Women’s Forum – Sri Lanka action continues with a year’s progress review, new plans and to celebrate our achievements on our 1st Anniversary and new member enrollments. 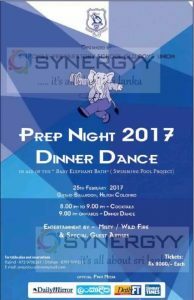 St. Thomas’ Preparatory School Old Boy’s Unions organise a Prep Night 2017 – Dinner Dance to aid the baby elephant bath swimming pool project. Dinner Dance schedule to be on 25th February 2017 at Grand Ballroom, Hilton Colombo from 8.00 Pm upwards. Premier Ceylon Hotels & Hospitality [Pvt| Ltd invites applications from the young ladies between 18 to 30 years to participate in this exclusive beauty pageant & contest to ramp with Miss England contestants & International Beauties in Sri Lanka & United Kingdom. Contest & Pageant will be accredited & judged by Panel of Judges nominated by Miss Englalnd Limited Winners will receive international level prizes & opportunities. 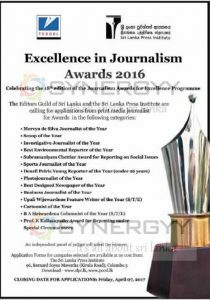 For Inquiries contact to www.premierceylon.com for nomination form, Nomination should reach Premier Ceylon on or before March 31, 2017. 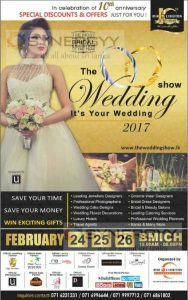 Asia Exhibition & Conventions organise a wedding show 2017 from 24th to 26th Feb 2017 at BMICH. Plan your wedding in greater manner and enjoy special discounts by doing pre-booking now. This Is An Open Invitation To All Beautiful Ladies And Smart Gentlemans To Participate In The RTC’s Best Couple, Best Dressed Lady, Best Hat And Best Dressed Gentleman. 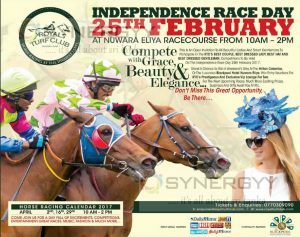 Competitions lo Be Held on The Independence Race Day 25th February 2017 at Nuwara Elia from 10 Am to 2 Pm. Stand a chance to win a weekend’s stay at the Hilton Colombo,Or The Luxurious Blackpool Hotel Nuwara Eliya. Win entry vouchers for RTC’s prestigious and exclusive VIP lounge for two for the next upcoming races. Much More Exciting Prizes. Surprises And Gifts Await You At RTC. Don’t Miss This Great Opportunity, Be There…. 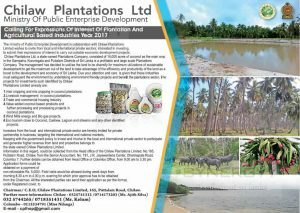 The ministry of Public Enterprise Development in collaboration with Chilaw Plantations Limited wishes to invite from local and international private sectors, interested in investing, to submit their expressions of interest to carry out suitable economic development projects. Inter cropping and mix cropping in coconut plantations. Livestock management in coconut plantations. Trade and commercial housing industry. 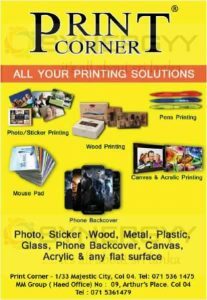 Value added coconut based products and further processing and processing projects in coconut plantations. Wind Mills energy and Bio gas projects. Eco tourism close to Coconut, Cashew, Lagoon and streams and any other identified projects. Keeping with the government policy to invest and involve in the local and international private sector to participate and generate higher revenue from land and properties belongs to the state owned Chilaw Plantations Limited. Chairman/ C.E.O, Chilaw Plantations Limited, 165, Puttalam Road, Chilaw. Jewels 2016 is a Gem & Jewellery Exhibition & Competition organized by the Gemologist Association of Sri Lanka schedule to be at BMICH Committee Lounge from 16th to 18th December 2016 from 10.00 Am to 6.00 Pm. 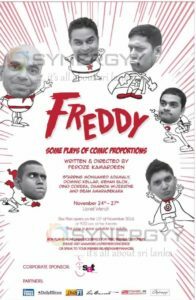 Feroze Kamardeen written & Direct exclusive entertainment event of Freddy – some plays of Comic Proportions on 24th to 27th Nov 2016 at Lionel Wendt. Concert starring with Mohammed Adamaly, Dominic Kellar, Gehan Blok, Dino Corera, Daminda Wijgratne, and Sean Amarasekara. Box plan is now open exclusively for HSBC premier customers please visit www.hsbc.lk/premerconcierge or speak to your premier relationship manager. 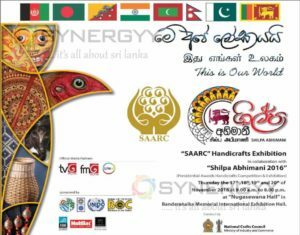 National Crafts Council, Ministry of Industry and Commerce organize a SAARC Handicrafts Exhibition in collaboration with Shilpa Abhimani 2016 (Presidential Awards Handicrafts Competition & Exhibition) Thursday the 17th ,18th 19th and 20th of November 2016 at 9.00 a.m. to 8.00 p.m. at “Nugasewana Hall” in Bandaranaike Memorial International Exhibition Hall. 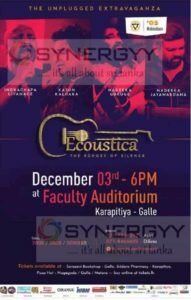 05 Mahindians Organised a Musical show of Ecoustica – The Echoes of Silence on December 03rd from 6PM at Faculty Auditorium, Karapitiya – Galle. The Ecoustica – The Echoes of Silence Musical show will be taken care of Indrachapa Liyanage, Kasun Kalhara, Nadeeka Guruge and Nadeeka Jayawardana. 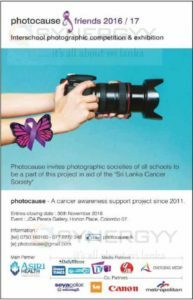 Photocause – A cancer awareness support project since 2011. Event: .IDA Perera Gallery, Horton Place, Colombo 07. 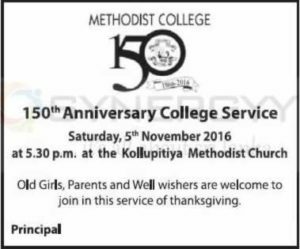 Methodist College Principal announced that 150th Anniversary Methodist College Service will be held today Saturday, 5th November 2016 at 5.30 p.m. at the Kollupitiya Methodist Church. Old Girls, Parents and Well wishers are welcome to join in this service of thanksgiving. 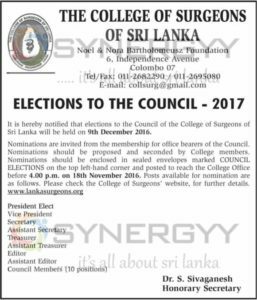 The College of Surgeons of Sri Lanka, It is hereby notified that elections to the Council of the College of Surgeons of Sri Lanka will be held on 9th December 2016.